We worked on nail structure in class. This was my first time attending a Nail Those Profits at Sea cruise. (It’s a wonderful experience if you get the opportunity!) I choose to go because of the education that was offered and, hmmm, let’s face it, any chance to go somewhere warm in January is bonus. I was asked by Holly to blog about our first day’s class, which was presented by Profiles Backstage. The focus was on the basics: prep and structure. 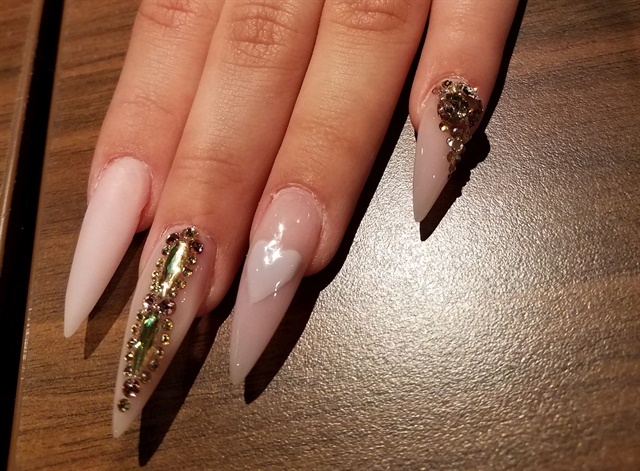 Ami did a step-by-step demo, covering everything from e-file usage, application, and finish work to a bit of bling to set off the beautifully structured foundation. Remove any lifted areas and thin out up to the apex area using a tapered barrel bit. Use a sciver bit to clear up the cuticle area working from center to left on forward, and center to right on reverse. Use a sanding band on low speed and make little circular moments to blend out the transition area. Your environment will affect your product, be it too hot, too cold, too humid or too dry. Your set times and ratios might need minor adjustments. Consider the amount of pigments in your powders — this can effect set times as well. Always start with a thin layer of either acrylic or gel and work that layer to your desired shape and length. This is your guide for the rest and if you take your time and shape it right, this means less work (less filing) in the end. Use a good cover base for your thin foundation layer, then building with a sheer coverage color will give you some depth. If you haven't seen or tried it, you should! This thin layer should help from flooding your sidewalls IF your cuticle work is spot on. Your thin layer should start about 3/4 way up from the free edge and the next layer from cuticle edge working out to free edge. A final is used if needed to enforce the apex area. There was chat throughout the class comparing this or that product line. We all have our own preference, but we need to be open minded about what’s out there. All of the info is non-brand-specific and non-product-specific. Ami and Traci put on amazing classes! I was able to get in on a class at a show in Tennessee last year and learned loads of little tricks from them. I cannot stress enough about continuing education — not just art education but the basics. Being in a class is nothing like watching YouTube videos. In a hands-on class you have the opportunity to follow along and get help as to why something didn't work. We all tend to get in a funk and sometimes a class in the basics is enough to get our excitement back. I know I am re-energized for my clients.